Last night I finally finished an A4 size map that I first started cutting since 3 weeks ago. 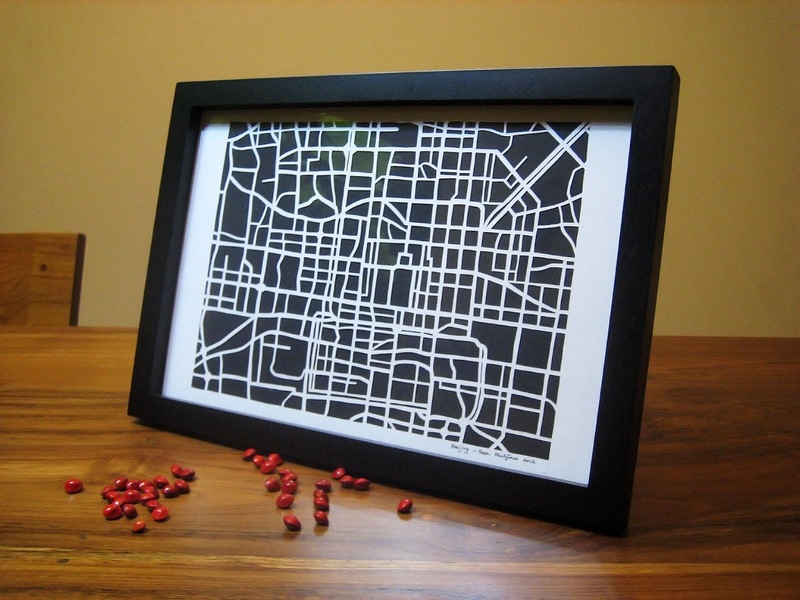 This (map of Beijing) is a follow up to the pair of 15cm x 15cm city maps that I cut. This is also by far the biggest and fullest piece I've done. Yes it was hurting my finger so much, the reason that it took me 3 weeks to finish is because almost every day I get new ideas or inspirations on what to do next and I end up getting excited about ideas for new projects and "abandoning" this map of Beijing. 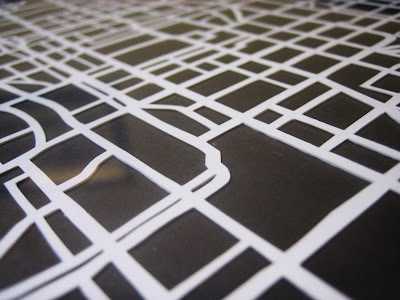 Every day at the office I steal some minutes (or more) to google search or check on some favorite papercutting blogs. And every day there surely is at least one thing that gets my brain excited wanting to try it out. Last weekend, even, without the presence of internet, I was having dinner with my father and an idea came through accidentally just by chatting! Ideas are listed on my book but I don't have that much time and energy to do them all. And what I fear the most is me slowing down and eventually abandoning those ideas. I hope not! Just as I was uploading the pictures for this post, I google again, and this time I found this awesome lady, Anna Bondoc whose particular blog post motivates me so much. She does not use digital software to draw her designs, and I don't either (more like: I don't know how work those softwares). She draws every design manually even when working on a bulk (dozens of card, dozens of bookmarks, etc). She stresses the goodness of pencil marks, slightly unclean cuts and and uneven spacings, because those are real. You can read the post here. It reminds me of a friend who told me that the idea having papercutting cut by machine is meaningless. For now, I need frequent such inspirations just to keep me going for the meanwhile. I don't know where this is going to lead, whether I am ever going to find my own style of papercutting or paper crafting, but as of this moment, I enjoy doing this in my free time, and I hope to keep doing this. This is sneak peek of work in progress based on idea sparked during dinner with Dad last weekend.